On May 28, 1998, a moderate size earthquake of mb 5.5 occurred offshore the northwestern part of Egypt (latitude 31.45°N and longitude 27.64°E). It was widely felt in the northern part of Egypt. Being the largest well-recorded event in the area for which seismic data from the global digital network are available, it provides an excellent opportunity to study the tectonic process and present day stress field occurring along the offshore Egyptian coast. The source parameters of this event are determined using three different techniques: modeling of surface wave spectral amplitudes, regional waveform inversion, and teleseismic body waveform inversion. The results show a high-angle reverse fault mechanism generally trending NNW–SSE. The P-axis trends ENE–WSW consistently with the prevailed compression stress along the southeastern Hellenic arc and southwestern part of the Cyprean arc. This unexpected mechanism is most probably related to a positive inversion of the NW trending offshore normal faults and confirms an extension of the back thrusting effects towards the African margin. The estimated focal depth ranges from 22 to 25 km, indicating a lower crustal origin earthquake owing to deep-seated tectonics. The source time function indicates a single source with rise time and total rupture duration of 2 and 5 s, respectively. 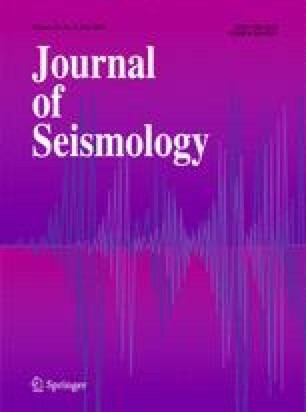 The seismic moment (M o) and the moment magnitude (M w) determined by the three techniques are 1.03 × 1017 Nm, 5.28; 1.24 × 1017 Nm, 5.33; and 1.68 × 1017 Nm, 5.42; respectively. The calculated fault radius, stress drop, and the average dislocation assuming a circular fault model are 7.2 km, 0.63 Mpa, and 0.11 m, respectively.